Technically I guess it’s pinned it Thursday but at least I did something this week! I’ve been extremely preoccupied at the office and in a few personal pursuits so it was nice to come home tonight, pour a glass of wine, and make dinner. I love sauces, creams, dips, marinades, gravies, chutneys, dressings, salsas – you name it. Well, as long as it doesn’t have mustard in it. 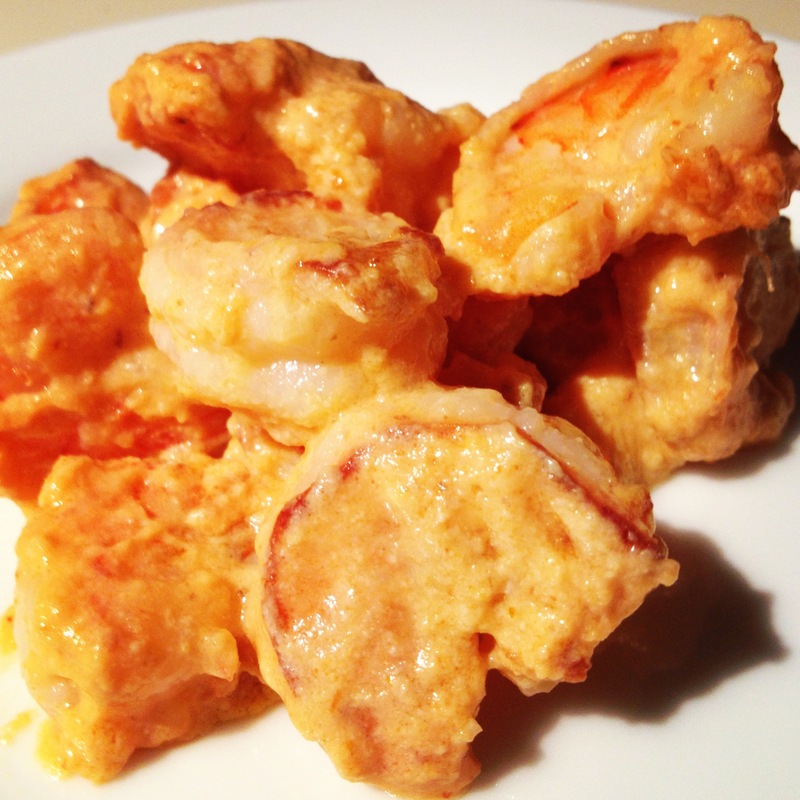 Before stumbling across this recipe, I had no idea what “bang bang” shrimp was (still don’t!) but given the emphasis on “healthy” in this particular concoction, I assume it is something generally considered less than good for you. Regardless, I couldn’t pass up shrimp tossed in a (healthy!) cream sauce. And it did not disappoint! Remove the shell, legs and tail from the shrimp and pat dry. Sprinkle with salt, pepper and two teaspoons of cornstarch and toss until evenly coated. In a food processor or blender combine the 14 ounces tofu (drained), 1/3 cup sweet red chili sauce, 3-5 Tablespoons sriracha sauce and 3 Tbsp lemon juice. Blend until smooth and creamy. In a large skillet heat the two Tablespoons of coconut (or vegetable) oil over high heat. Add the shrimp and stir every minute or so until the shrimp is cooked through (opaque all the way through) for about 4-5 minutes. Turn the heat down to low. While these are cooking, thinly slice 2 green onions. With the heat at a lower temperature, add about 1/2 cup of the creamy spicy sauce and toss until the shrimp is evenly coated. Serve on a bed of Red Cabbage Asian Slaw (which I of course did not do because I hadn’t read the recipe close enough when I was purchasing ingredients!) and garnish with the chopped green onions. ← Perfect cure for my case of the Mondays!